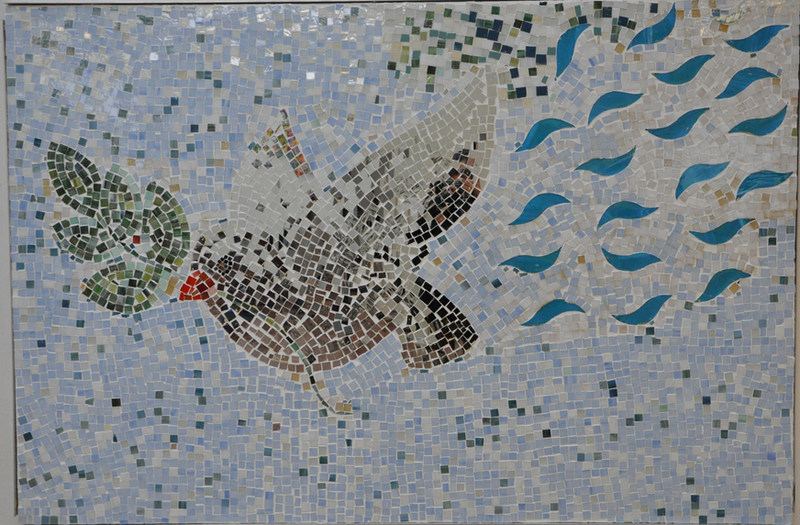 “Feather Story,” the mosaic pictured above, was created by the entire school on the first Power of Words Day. 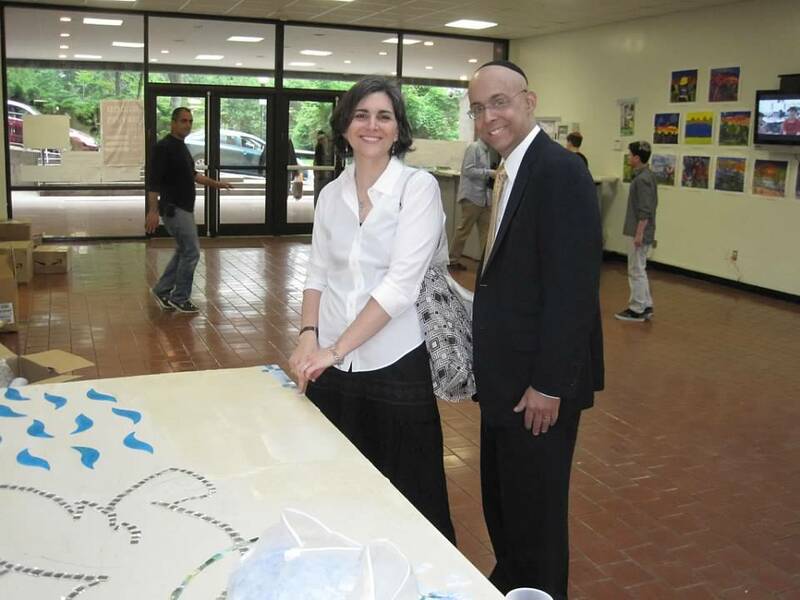 Jennifer and Matthew Fenster placed the first few tiles on this mosaic, which was later dedicated in memory of Matthew z”l, in September 2011. In Spring 2011, when SAR parent Matthew Fenster z”l was dying of leukemia, he was determined to find a way to fill his remaining days with meaning. He had been writing a blog that chronicled his illness, and he published a blog post in which he made a commitment to avoid lashon hara for the remainder of his life. He invited his readers to join in this effort, writing that it would provide him with great support and comfort during this time of unimaginable challenge. Click here to read Matt’s blog post in which he described this final wish. Moved by Matt’s message, Rabbi Binyamin Krauss asked for permission to share it with the SAR community. The blog post resonated deeply with many people, so with some very quick and skillful organizing by the SAR administration and staff, the first SAR Power of Words Day was launched in a matter of weeks. An entire school day was dedicated to reflecting upon and teaching the importance of shmirat halashon, using our spoken and written words nicely, avoiding lashon hara, and understanding that words can hurt and words can heal. The Middle School students were privileged to have Matt address them directly on that day. The program was tremendously inspiring. After Matt passed away that summer, the idea emerged to continue the program each year in Matt’s memory. It was a simple decision to make, and under the leadership of Matt’s wife, Jennifer Fenster, Power of Words Day has become part of the fabric of SAR Academy ever since. Each year on Ta’anit Esther, staff and students from the ELC through the Middle School are encouraged to choose positive words and avoid hurtful ones. The program embodies the teachings of the Chofetz Chaim, applying his lessons about lashon hara to our modern day society. In the weeks prior to Power of Words Day, students learn about shmirat halashon halachot in their classes while engaging in meaningful discussions about positive word choices and respectful dialogue. Part of SAR’s stated mission is to create a community of b’nai and b’not Torah who demonstrate sensitivity for their peers, respect for their teachers and environment, and an appreciation of the differences in others. Power of Words Day so perfectly advances this mission and brings it to life in the most beautiful of ways. From a modest blog post with a final wish came an incredible annual schoolwide program that uplifts, educates, and inspires the entire SAR community and beyond year after year. Click here to view photos of this year’s 9th annual Power of Words Day.